'I would go a little further. One of the issues we face today is the ever-increasing division of classical performances into small, ghetto-like compartments. Forty years ago Fischer-Dieskau could be a giant among singers whether he was performing Bach or Wagner, Schubert lieder or Weber operas. For modern performers that doesn't seem possible. The baroque period has largely been abandoned to specialists. Even performances of Mozart, Hadyn and even early Beethoven, which used to be a staple of most symphony orchestras' concert seasons, are becoming rarities. Carl left that comment on my post Is classical music too lean and mean? I thought it worth a post of its own and I would add to those examples of Dietrich Fischer-Dieskau's virtuosity Messian's opera Saint François d'Assise. I wonder if Carl's Christmas list also includes Britten's St John Passion? 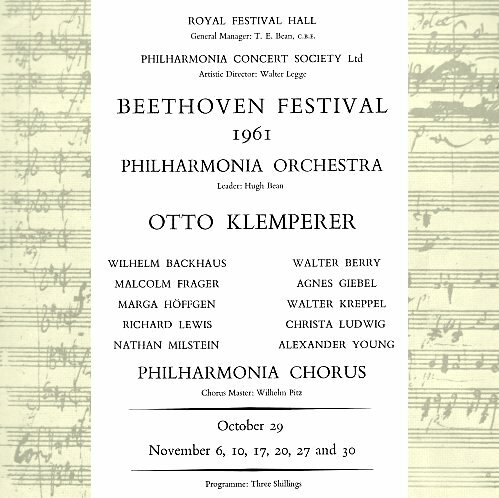 Header image is title page from 1961 London Beethoven Festival from my own collection. Look at that stellar line-up of non-specialists. Plus the notes were by Ernest Newman and William Mann and the programme cost 3 shillings (15 pence) Those were the days! Carl's comment has been gently edited by me. Report broken links, missing images and errors to - overgrownpath at hotmail dot co dot uk Also on Facebook and Twitter. Gerard Schwarz in about 1987, not long after he became conductor of the Seattle Symphony, made a similar point (I wish I could recall the exact source). He said that any orchestra needs the solid grounding in, say, Bach Brandenburgs and Handel Concerti Grossi which orchestras used to have as a matter of course, but that since this repertoire has largely been hived off to specialists who play nothing else, a whole aspect of orchestral training has thereby gone by the board. Pity. I agree with Carl's comment in general, but I suggest that the situation is somewhat overstated. In the last few years, I've heard excellent performances of the St. Matthew & St. John passions with a subset of the Toronto Symphony. Conductors were Nicholas McGegan & Helmuth Rilling. Also, there are excellent recordings of Bach, Schubert, opera arias, and 20th C music by (to take two obvious examples) Quasthoff & Goerne. And if I look through local listings, I have no trouble finding Mozart and Beethoven listings with "general-purpose" orchestras, including "festivals" for each composer. Mind you, I think a shortage of Mozart & Beethoven for a few years would be a fine thing. If there is the looming shortage that Carl suggests, perhaps it's due as much to continued over-exposure as anything. I totally agree, including with the Barenboim/St Matthew AND Britten/St John exemples; I believe the key issue her is the historicist inflation that has grew up as the musical desire of the audiences was getting more and more focused on middle and late-romantic music, mostly orchestral and more especially Mahler. Some conductors are starting to realize how deeep the problem is : they can see an incredible quantity of great professionnal BUT also some almost amateur orchestras are able to play a Mahler symphony, with great commitement and sense of the music character, but are totally unable to play a Mozart symphony (in whatever so-called style would be chosen). As if they had already started to feel illegitimate : now, I'm not even sure Mahler himself would have appreciated being adored in this post-modern/historicist way... Being the Beethoven of XXIth century orchestras may not be such a very great destiny. All isn't lost. Some areas remain in which the generalist musical mind can flourish. The organ, for one. There have been a handful of specialists in, say, baroque organ music (Ton Koopman and Herbert Tachezi are two instances) but most organists find that if they want careers at all, then they must acquire a substantial chronological range of repertoire, from the 17th century to the 21st. A seasoned organist such as Dame Gillian Weir, Jane Parker-Smith, Jennifer Bate, Simon Preston, Thomas Trotter, Michael Murray, or that young American genius Paul Jacobs can - and does - play in public just about anything ever written for the instrument, from Buxtehude and Samuel Scheidt, via Bach, via Mendelssohn and Franck, via the Widor-Vierne school, to Messiaen and beyond. It would never occur to these performers that they had to stick to one or two composers or a solitary epoch, the way so many conductors and pianists now do. 99.9% of orchestras couldn't play Mozart for decades. It took the arrival of ensembles who didn't treat Mozart as the amuse-bouche for their Mahler for us to realise. I can't comprehend the point of view that an orchestra needs a solid grounding in Bach or Handel. Come on, chaps. That's chamber music. Davis has also said that, of works he would most still like to record, he would choose the St Matthew Passion, but noted that, alas, the 'specialists' would never allow that. Who are these specialists? Why did they not stop Chailly recording it or Rattle performing it recently? Is there seriously a suggestion that some of Davis's fellow musicians have a power of veto over his prospective projects? I can't imagine it. No one in their right mind would want to confine Baroque music to specialists alone. (In any case no one is actually doing that, as Scott pointed out.) But surely no one in their right ear would suggest that specialists haven't incomparably enriched the scope available for interpreters and listeners alike in great swathes of the repertoire. Of course today's finest orchestral performers still perform Baroque music if they think (and if they can convince the right people) that they have something to say in it. On the other hand it's only reasonable that the immensely dedicated and talented performers who specialise in the sound of a particular era should get a hearing as well. All the better for all of us. 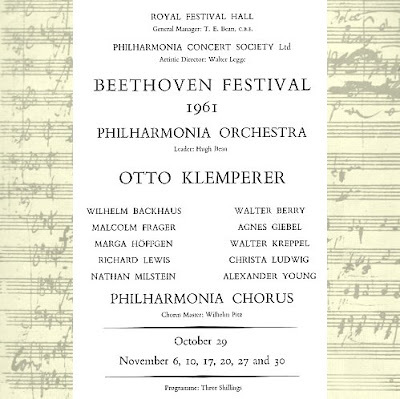 the present situation would have been incomprehensible to great conductors of the past, whether Walter, Klemperer, Mengelberg, or Furtwängler. How is one to hear the Bach in Mahler, let alone the Mahler in Bach, if one does not know Bach - and know him intimately? Walter, Klemperer, Mengelberg or Furtwängler certainly knew Bach's scores intimately. But how intimately did they really know his sound? Mahler played Bach in New York on a piano with drawing pins in the hammers - thank goodness for our specialists and their harpsichords. I'm a very great fan of Furtwängler's Brandenburg 5. I'm also a very great fan of Café Zimmermann's. I consider myself very lucky to be able to hear them both. Well, 'specialists' might include the likes of Reinhard Goebel and Gustav Leonhardt, both of whom described Furtwängler's Bach as 'disgusting': not bad, not misconceived, not a curiosity, but 'disgusting'. A review I once read, of a work by Monteverdi (I'm afraid I can't recall which one) described use of period instruments as 'mandatory'. There is certainly one reviewer in a well-known record magazine (clue: it is a far superior to what 'Gramophone' has sadly become) who jumps on the slightest hint of vibrato as a reason to condemn a recording out of hand - and that despite all the evidence pointing, even on 'historicist' terms, to widespread use of vibrato in eighteenth-century music. It is such joyless fundamentalists who, unfortunately, have set the tone for far too long and have scared off others (including, I surmise, Davis) from touching the music. Even when someone such as Chailly performed the St Matthew Passion, it was a performance that in many ways might as well have been on period instruments, perversely making the Gewandhaus Orchestra renounce its sound, and was for the most part taken at a speed that left many 'authenticke' performers standing. The great chorale closing the first part, ‘O Mensch, bewein’ dein’ Sünde groß,’ was taken at an almost unbelievably fast tempo, the sense of detachment from the words - this is a Passion, for goodness sake! - downright bizarre. A Passion, what should surely be a drama at least as overwhelming as 'Tristan', seemed to have been turned into a geometrical exercise. A considerable ritardando at the end of the chorus and, still more so, the extremely prolonged final bass note sounded merely as arbitrary ‘effects’ - presumably thrown in to show that this was somehow a 'modern' performance, whatever that might mean. Whatever one thinks of Mengelberg's fluctuations of tempi, one does not have to struggle to understand them as a response to the text. Adorno had the fundamentalists in mind then when he referred to the ‘sectarian’ nature of 'Historismus'. As he saw it, the sole concern of those he dubbed Bach’s ‘devotees’ was to ensure that ‘no inauthentic dynamics, no modifications of tempo, no excessively large choirs and orchestra’ should be employed. Palpable was the potential fury, ‘lest any more humane impulse’ should become audible. When one thinks of Bach's freeness of instrumentation with his own and others' music, the situation is truly absurd. Ironically, then, a presumed ‘absolute’ sound of the eighteenth century – itself a distorted product of nineteenth-century conceptions of ‘absolute music’ – has in some cases at least, and those cases tend to be those in which the shouting is loudest, become an exclusivist end in itself, a way of marking out the 'informed' from the rest. Specialization is indeed an issue, not only artistically speaking, but also in terms of audience segmentation. The more we specialize, the more we segment the audience, the tinier our audience gets. Let's take a simple example. The baroque fans used to go to their local symphony to listen to concerts. There, they surely heard baroque music, but also other works from other periods. Lately, they began to go only to concerts of a baroque ensemble. The audience of the local symphony declined, causing financial troubles. The baroque ensemble's audience is not big enough to avoid financial problems and easily raise funds. The baroque fans stopped discovering new works, and other periods, thus stopped buying records other than baroque, and so on... It seems to clearly be a loose-loose situation. I drew attention on this a few weeks ago on my post "About reaching new audiences" http://bit.ly/lkKXXw . I'm glad to see that people are more and more aware of the hidden issues of specialization.